Welcome to our Ischia blog, Good Morning Ischia! Here you can see the entry for Thursday 10th October 2013. For logistical reasons today's blog entry comes a bit earlier than normal with normal service due to be resumed on Friday morning. The weather today has seen a mixture of warm afternoon and morning sunshine with a few scattered showers around and temperatures reaching a maximum of 25 celcius/76 fahrenheit and the trend looks set to continue for the rest of this week. 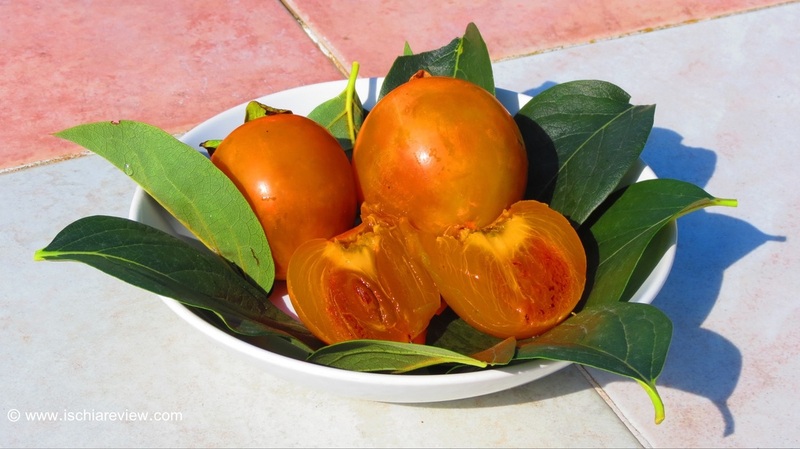 Today's photo is of a Persimmon fruit or known locally as "Cachi". In many countries the fruit is quite rare but it's quite abundant in Ischia, particularly at this time of year when the fruit is ripe. In some ways the Cachi resembles a tomato but is slightly larger and orange in colour. The sweet taste and soft texture is a delicious combination and definitely worth trying if you happen to be in Ischia at this time of year. One of the many joys of living in Ischia is the ability to live from the natural fruits and vegetables of the island and there is always something new in season, just as something else fades away for another year. We'll keep you up to date with the seasonal fruits and vegetables throughout the year and maybe add a few recipes along the way. It would also be great to hear from any keen cooks or even gardening enthusiasts out there to provide their own recipes or growing tips so drop us a line at info@ischiareview.com and let us know what you're thinking.